It’s funny the things that stay with you, and it’s funnier still the connections you make between them. I have a very clear memory, aged 11 of being at the top of my school playing field. This being the Isle of Man it was both literally a field and almost entirely at a 45 degree angle. They actually had to landscape a good chunk just to fit a football pitch in halfway up and dig out another section to fit in a concrete play area at the bottom of the hill. I was at the top of the hill by the red brick stone wall that ran along the top of the field. About half a mile away a country lane defined the edge of the field and separated it from the churchyard of the local Anglican church. There was an old fashioned five-bar gate built into the church wall that matched one built into the playing field wall. I, and two or three other kids, were happily playing when I noticed a man walk up to the church gate. He didn’t have legs. It didn’t stop him walking up to the gate, or leaning on it. He had a very nice hat too, a stereotypical Puritan one. He was maybe a quarter mile away, and it was a hot, sunny day and we could see all of him very clearly. And, like I say, he didn’t have any legs. I remember us passing comment on this and then I remember very distinctly, the wind changing direction and blowing hot. I seem to think he turned and left at that point. I do know the bell for the end of lunchbreak rang, in we went and thought no more about it. Nothing much, just the tiniest hint of Summer Forteana. It was, and still is, infinitely more likely to be someone too far away to see clearly, in possession of a full pair of legs, leaning on a fence watching some kids play than anything supernatural. After all, the only thing more active than a child’s imagination is a creative’s inability to see the worth in what they do sometimes. Skip forward a couple of years and I was busily reading as much 2000AD as humanly possible. Still a vitally important part of Western comics, 2000AD was, and is, an anthology. It runs somewhere between 4 and 6 strips a week and each one varies wildly in style, tone and subject. Very nearly every single British comic creator of importance over the last thirty years has learned their craft through 2000AD. It’s spiky and organic and weird, occasionally God awful, often brilliant. It’s like Radio 4 with added punching and ‘Drokk!’s. There was one particular strip, The Journal of Luke Kirby, that really had my attention. Written in flashback, it was the story of a young boy who found out, in short order, that he had the potential to be a great magician and absolutely no step on the way there would be easy. It was a gloriously smart, often very horrible series of stories written by Alan McKenzie and illustrated with tremendous detail and emotion by John Ridgway. Looking back, it strikes me that was my first introduction to postmodernism, the referencing of Sympathy for the Devil neatly keying the reader in to something being badly wrong. At the time all I knew was that this was exactly the sort of story I loved and I wanted more of it. The search led me through the Grant Morrison run on Hellblazer (Reprinted, I’m still fairly sure by accident, in newsstand titles for a while in the UK), the stunningly brilliant Lords of Misrule and Knights of Pendragon and finally up through the likes of Hex, Urban Gothic and Supernatural. They’re all horror stories that share a boundary with dark fantasy and childhood, and all, at their heart, about something impossible making eye contact from the other side of a country lane. Traveller’s Duty is cut from the same cloth and works just as well. It follows Connor Alasdair, a young teenager with two concerns; his family and his best friend, Sarah. Connor’s home life is stable to the point of apparent tedium, Sarah’s is a constant rolling nightmare. Neither of them fit in anywhere but with each other and the mutual support society they form is something that rings very true. No one on this planet is tougher than children in extreme situations and Dillon nails every scene with them. There’s the sort of easygoing banter you get from best friends, the slight hint of romantic tension that’s both inevitable and welcome and a deep current of love running underneath every one of their actions. One of the most poignant sections of the book is right at the start, where Connor’s parents take steps to not only help Sarah but have her move in with them. It’s not operatic or hysterical, no big fuss is made. Instead it’s a uniquely British moment of quiet heroism as they conspire to help out a child who desperately needs it. What’s really interesting is how Dillon contrasts this with the things they’re keeping from their son. Connor’s parents have a very unusual past that’s only beginning to be explored and it gives Dillon a chance to stretch his action muscles to great effect. A glimpsed fight early on is particularly effective but it’s the closing sequence that really works. Connor, Sarah and their allies are pursued through the streets by monstrous Chimera and discover that this eventuality has been prepared for. There are no overt fortifications or protection for them, but rather a small, dedicated and hidden network of allies. It’s a clever way of not only introducing the plot elements for the sequel, but also showing just how pressed Connor’s parents were. It also, very subtly, questions their actions. There’s a larger agenda here and it may not be an entirely positive one on either side with Connor being forced to choose between the two. It’s a level of moral ambiguity that’s barely hinted at here, but Dillon doesn’t need to do any more than that for now. Instead, he peels away the layers of Connor and Sarah’s world and shows them what’s really going on, but not quite why. He cleverly tells us more than the children though, and through Corben, the endlessly patient and near immortal warrior, we get an idea of just how important they are to the great scheme of things. Just what that scheme is though, he keeps from both us and Connor and Sarah, at least for now. Traveller’s Duty is a remarkable, confident debut novella that sets up a fascinating world and, crucially, peoples it with characters you care about. 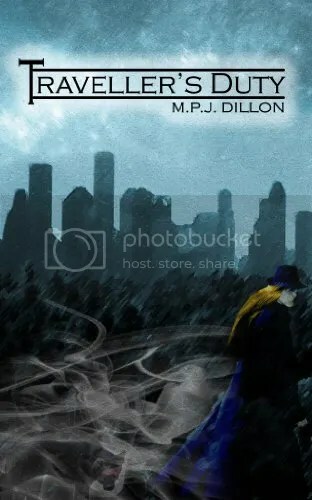 Dillon’s tapped into a vein of uniquely British fantasy here that will resonate with people just like it has with me. Equal parts funny and horrific, it’s available now, as is the sequel, Traveller’s Promise as well as an audio version of Traveller’s Duty. Pick them up, and get ready for a journey into the deep strangeness of British modern fantasy.